Welcome to the Year End Ascent Technology Newsletter of 2015. As everyone anticipates fully getting into the holiday mood of the Festive Season, we take a moment to reflect on the recent past and consider the future. There is no doubt that 2015 has been a successful and eventful year and one in which we have witnessed some interesting trends and again experienced a number of milestones and memorable moments. Of course, 2015 was also accompanied by its challenges as well. The most notable of these was the protracted economic “slow go” facing not only South Africa, but the rest of the world as well. Looking forward towards 2016, it is our view that these challenges are not yet over, and that we can fundamentally expect more of the same. However, while we cannot expect a major boom in the market, we do believe there will be moderate growth next year. 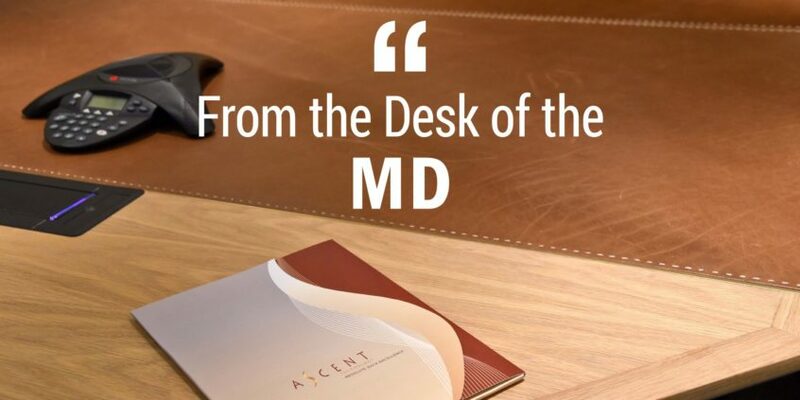 From Ascent’s perspective, we remain positive about our company’s future. We are also anticipating more of the same in 2016, meaning that we will in all likelihood continue to experience the kind of growth and success we had during this past year. We anticipate the year ahead to be a busy and exciting one, where we will continue our growth, acquire new clients and witness improved service delivery levels to our existing and new clients. Ascent has continued to go from strength to strength, irrespective of the difficulties presented by the ongoing economic challenges. We have seen our business continue to improve and have been able to repeatedly build on our successes throughout this period. This stability has enabled us to continue to provide our clients with the service and value to which they have become accustomed. However, we are well aware that our continued success is only due to the strength of the partnerships we have with our clients and our principles whom, along with our people, are the most valuable aspects of our business. Bearing this in mind, I would like to extend my most heartfelt thanks and gratitude to every one of Ascent’s clients, people and partners – we value every one of you and appreciate the role each of you have played in helping us to achieve the success we have during 2015. For the fifth year running, Ascent Technology received the Microsoft Data Platform Partner of the Year Award. The Microsoft Partner of the Year Awards are highly regarded by Microsoft, its partners and clients, as only those who have truly excelled in delivering Microsoft solutions over the previous year are nominated. Winning new customers, driving customer satisfaction, growing the business, innovation and enabling people are all factors taken into consideration by the judges. We are proud to have once again been recognised by Microsoft as one of the leaders in the country in the Data Platform Space, amongst what is a wide range of talented Microsoft partners. This honour will serve as continued inspiration to continue delivering the kind of award-winning service our clients have come to expect from Ascent. It has now been a year since First Technology Group took an equity stake in Ascent Technology. This has been of enormous benefit to us, as we have been able to compete on a larger scale than ever before. The alliance has gone from strength to strength over the past twelve months and has significantly increased our business opportunities, as it has considerably broadened our client base. On a related note, First Technology Group, including Ascent, was one of the major winners in the Microsoft Partner of the Year Awards, with the Group ultimately walking away with a total of five awards, indicating just how strong the entity is in the Microsoft space. Ascent’s commitment to building skills for the future continues unabated, as our ninth yearly Microsoft Internship programme nears its conclusion. Our current four interns involved are expected to graduate from the programme at the end of this year. Continuity in skills and expertise is of vital importance to our clients, which is one of the key reasons we focus on continually developing a new generation of highly skilled individuals. Ascent is certainly excited to be able to play a key role in kick starting the careers of these graduates, while at the same time offering a genuine value add to our clients. Speaking of adding value, in this past year, Ascent has been heavily involved in assisting clients to upgrade their Microsoft Database Environments to Microsoft SQL Server 2014. These upgrades have enabled our clients to unlock additional technologies, allowing them to be more flexible and thus better able to respond to these fast changing times. Looking ahead, we are especially enthusiastic about the forthcoming release of Microsoft SQL Server 2016, and the additional benefits this will offer clients. Ascent is excited about the opportunity this will afford us to facilitate our clients’ adoption of a hybrid cloud environment, thanks to the exciting new hybrid cloud features and technologies baked into SQL Server 2016. Of course, Ascent also remains committed to being a technology heterogeneous player in the Enterprise Database Management and Consulting Space. As such, we want to remind our Oracle clients that we will be able to unlock the same kind of additional value for them from an Oracle and also a MySQL perspective. Ascent is thrilled to announce that we will be launching a brand new WebStore in 2016, which will enable clients to purchase our and our partners’ cloud services online with Ascent. Be on the lookout for the launch of this platform, which will enable us to take our service to a whole new level, in the New Year. Since moving into Sandton last year – into the very building that was recently voted the coolest building in Johannesburg – we have found ourselves situated in the heart of a vibrant and changing city. Nothing illustrates this better than the recent Eco-mobility Festival held here. We are pleased to have been a part of this unique and interesting experiment that demonstrated that there are other options available to commuters, other than the dense traffic and gridlock we are used to. And so to close, all of us at Ascent wish you all a very happy and peaceful Festive Season and we hope that whatever you are doing during the holidays, it will afford you the chance to rest and relax. We look forward to welcoming you back safe and sound in 2016, so that we can kick off a new and fruitful business year together.